CHARLOTTESVILLE, VA — To ensure the security of airline passengers and the nation’s airports, the Transportation Security Administration (TSA) has begun to implement new, stronger screening procedures for carry-on items at airports across the country with the procedures now in place at Charlottesville Albemarle Airport. The new procedures require travelers to place all personal electronic devices larger than a cell phone in bins for X-ray screening and are designed to address the current terror threat by raising the baseline of aviation security. The new procedures were originally announced earlier this year. The terror threat is real and TSA is committed to raising the baseline for aviation security by constantly enhancing its security procedures to stay ahead of evolving threats. As TSA implements this new procedure, passengers at Charlottesville can expect to see TSA officers ask travelers to remove electronics larger than a cell phone from their carry-on bags and place them in a bin with nothing on top or below, similarly to how laptops have been screened for years. 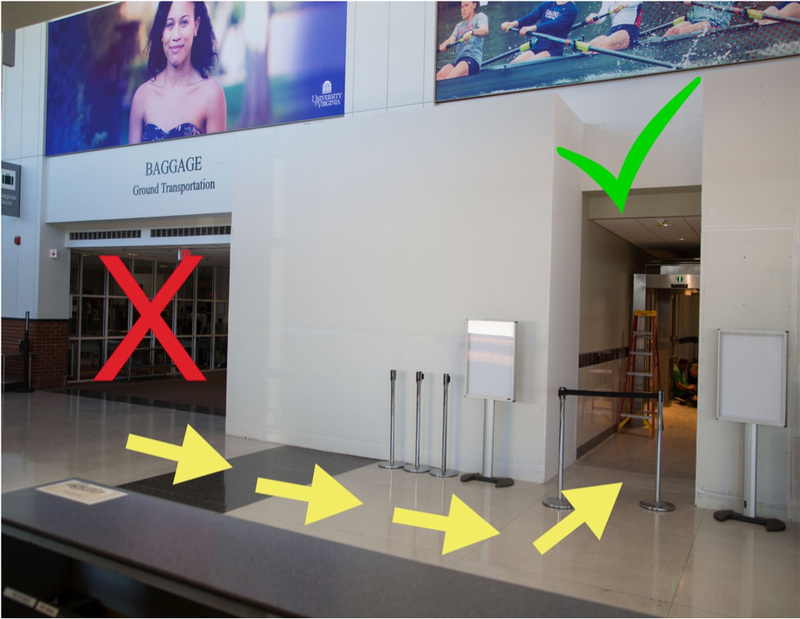 This simple step helps TSA officers obtain a clearer X-ray image by uncluttering carry-on bags, thus allowing for a clearer X-ray image for TSA officers. Some examples of personal electronic items that should be removed from carry-on bags include laptops, tablets, e-readers and cameras. The new procedure is currently being phased in nationwide until all of the checkpoint lanes at all airports are brought on board in the weeks and months ahead. The incremental launch allows time for all TSA officers to receive training in the new security procedure. The new security measures do not apply to passengers enrolled in TSA Pre✓® who are using TSA Pre✓® lanes. It is possible that more carry-on bags may experience bag checks, however, TSA has identified ways to improve screening procedures for carry-on bags, with quicker and more targeted measures for officers to clear the bags. There are no changes to what travelers can bring through the checkpoint. Food and liquid items that comply with the 3-1-1 liquids rule, electronics, and books continue to be allowed in carry-on bags. As always, TSA suggests passengers arrive to the airport 90 minutes prior to their scheduled departure time to allow adequate time to navigate the ticketing, baggage check-in and security screening processes. As Hurricane Irma continues to move inland, it will have an impact on CHO’s two most southern Hubs. Flights to Hartsfield-Jackson Atlanta International and Charlotte-Douglas International Airport will be affected. Passengers can expect to see continued delays and cancellations as they work through the storm and resume to normal operations. We encourage all passengers to stay in touch with their airlines regarding flight changes. We will also issue any statements from the airlines on our facebook page Facebook/CHOairport and on our website at www.gocho.com. TRAVEL ADVISORY – PASSENGERS ADVISED TO REMAIN IN CONTACT WITH THEIR AIRLINES REGARDING FLIGHT STATUS DUE TO OUTAGE CAUSED BY DAMAGED CABLE AT RIO ROAD & ROUTE 29 – UPDATED: 3/7/16 5:45 p.m.
An underground CenturyLink cable was damaged early Monday morning during road construction at Rio Road and Route 29. This has caused data and phone outages for a large portion of northern Albemarle County, including the Charlottesville Albemarle Airport. This outage is impacting each of the airlines that provide service to CHO Airport in a different way. As a result, we encourage anyone with scheduled flights to remain in contact with their respective airlines. Contact information for the three airlines providing service to CHO Airport can be found below. Passengers are also advised to allow additional time when arriving to CHO Airport, since some airline procedures are taking longer than normal due to this outage. The latest release from the Virginia Department of Transportation anticipates CenturyLink will restore service to all customers by Tuesday morning. We will post additional details as more information becomes available. TRAVEL ADVISORY – PASSENGERS ADVISED TO REMAIN IN CONTACT WITH THEIR AIRLINES REGARDING FLIGHT STATUS AFTER WINTER STORM – UPDATED: 2/16/16 3:15 p.m.
Winter weather has moved away from CHO Airport, but there are still some delays being reported, as operations continue to return to normal. All passengers are encouraged to remain in communication with their airlines regarding any specific questions about their flights. Contact information for the three airlines providing service to CHO Airport can be found below. On Tuesday, January 26 the TSA checkpoint screening area made a move to its final location as part of the terminal improvement project. Passengers will enter the checkpoint through a new queuing area to the right of the screening area. 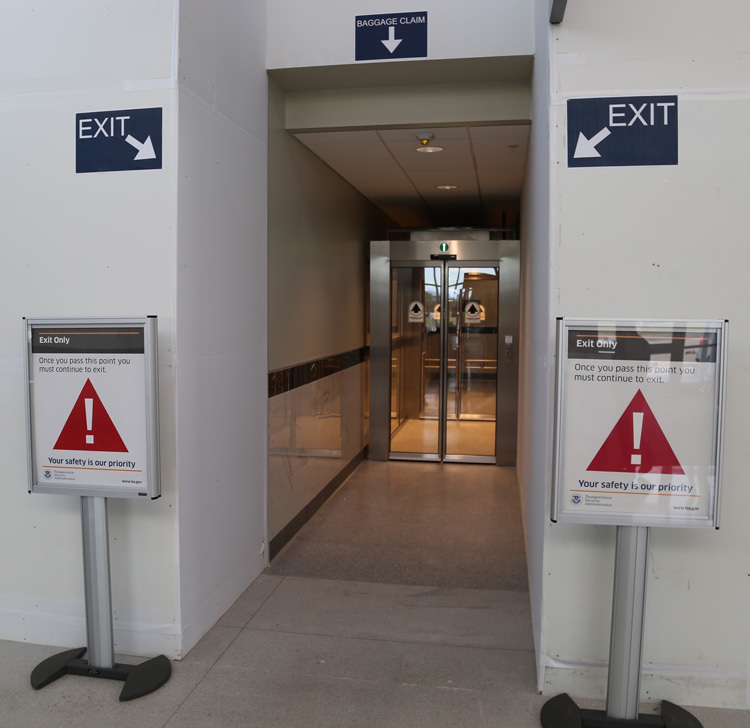 Passengers will then proceed through a glassed-in area and enter the new screening location. There will be plenty of signs to guide you along the way. This will be the final move for the TSA checkpoint area and this also marks the completion of another phase of the terminal improvement project at CHO Airport. TRAVEL ADVISORY – ALL AIRLINES HAVE RESUMED SERVICE AT CHO AIRPORT. PASSENGERS STILL URGED TO STAY IN CONTACT WITH AIRLINES ABOUT FLIGHT INFORMATION – UPDATED: 1/27/16 10:45 a.m. The three airlines providing service to CHO Airport have resumed service in the wake of this weekend’s snowstorm. All passengers are still encouraged to remain in communication with their airlines regarding any specific questions about their flights, as it may still take time for operations to completely return to normal. Contact information for the three airlines providing service to CHO Airport can be found below. Crews are continuing to treat and remove snow from the parking areas at CHO Airport. Assistance will be available if you need help clearing the snow from your car. We will also be continuing to provide updates on our social media channels. On Facebook, you can follow us at www.facebook.com/CHOAirport or on Twitter at www.twitter.com/CHOAirport. December 9 was the last day of the original TSA checkpoint screening area location. The entry point for TSA screening has now changed (see left side of pic). During the extremely busy flight times an extended queuing area may also be opened (see right side of pic). Plenty of signs will help guide you along the way. We anticipate the final TSA screening area to be open in the next few months. Expect increased delays and traffic along Route 29 over the next several weeks as road work associated with the Route 29 Solutions project continues. These construction projects will impact traffic at the Route 29/250 Bypass interchange, the Rio Road intersection, and the stretch of Route 29 from Polo Grounds Road to the Hollymead Town Center. Be on the alert for detour signs and allow extra time when traveling to CHO Airport, as you may encounter delays and increased traffic. Passengers with early morning flights are especially encouraged to allow extra time for their drive to CHO Airport, as some of the road construction will take place during the overnight hours. Effective immediately, a new exit lane is now in use. 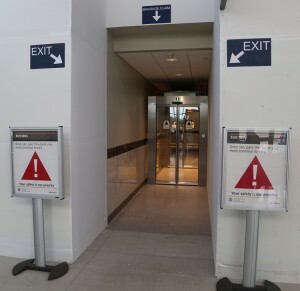 After landing and entering the gate concourses, please follow the signs that will take you through the new exit lane and into the baggage claim area. 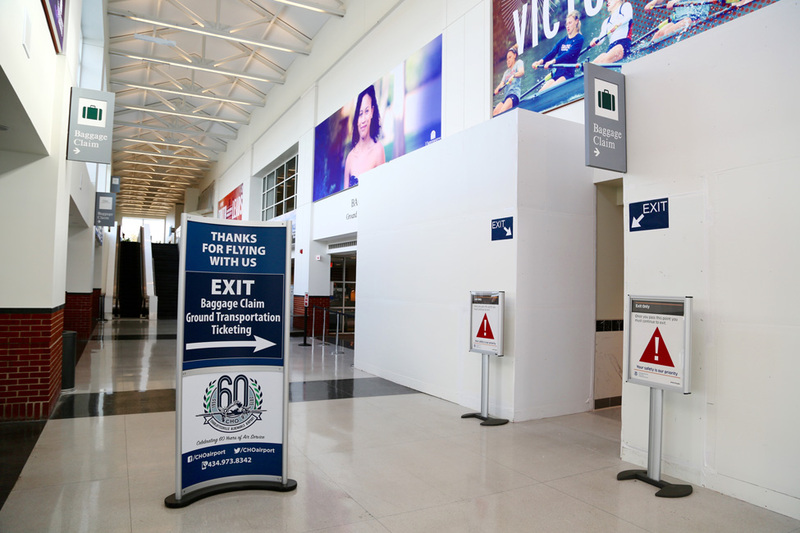 This new lane, which replaces the old revolving door exit area, will allow for easier and more efficient exiting and access to baggage claim, while easing congestion during periods of heavy passenger traffic. Meeters and greeters are advised to wait for arriving passengers in baggage claim. The new exit lane is located immediately to the right of the old revolving door.